The day was beautiful. Warm, but not a cloud in the bright blue sky. By the time I got to the tent where the rest of the bridal party was waiting P and his parents had already walked out arm in arm. 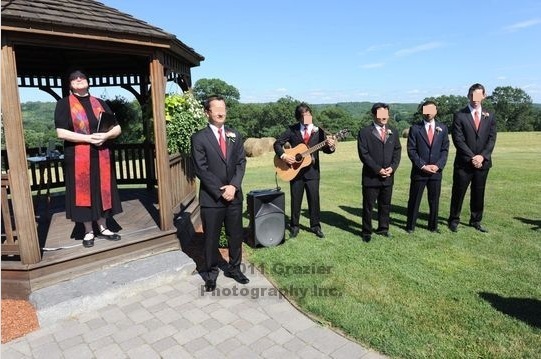 P’s brother U was already next to the gazebo playing Jesu Joy of Man’s Desiring on his guitar as our processional. 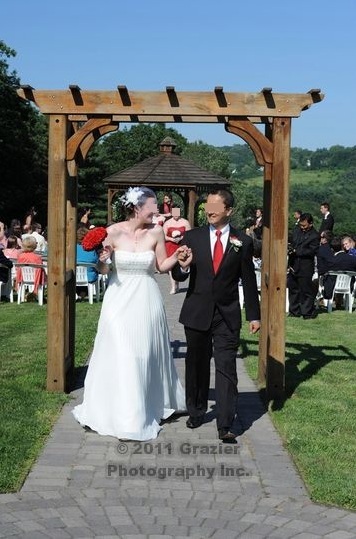 AS and RH walked out together down the stone path to the gazebo, then R and D, then my younger sister M and P’s best man S, finally my maid of honor—my sister K walked out alone right before I walked in with my dad on my right arm and my mom on my left. I don’t really remember much from walking in other than my dad whispering, “Slow down, people are trying to take pictures.” At that point your brain kind of goes into autopilot. 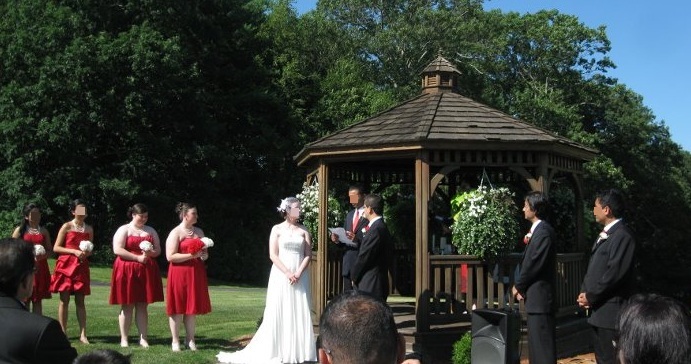 I think I hugged both my parents and took P’s hand and then I was there, standing in front of the gazebo, starting the wedding ceremony. 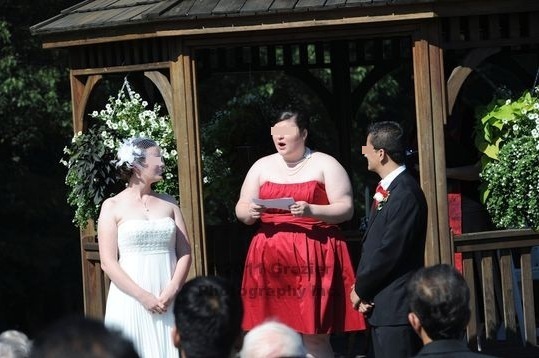 I remember thinking silly things like—should I stand with my side to the guests looking at P the whole time? Or should I turn and face everyone and make eye contact, like a speaker in a presentation? (Which I did a few times, I’m such a nerd.) We held hands through the ceremony, and stole long smiles. AS, R, my younger sister M, my middle sister K.
He had told us in advance he was going to give us high fives after—but opted for a quick hug. D reads "Art of a Good Marriage"
Those that truly love, have roots that grow towards each other underground, and when all the pretty blossom have fallen from their branches, they find that they are one tree and not two. Then P and I read our vows to each other. 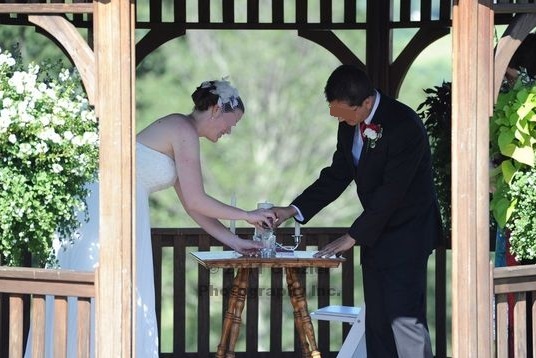 I wrote my vows while P and I were driving down to Philly to help his brother move about a month before the wedding. I figured I would share my vows with P since he is less familiar with what vows generally sound like, so as to give him a baseline for what he might plan to write (it seemed only fair). I remember when I read them in the car (he was driving), that he got a little choked up. Just a little bit, but it was there, and it made me happy to know he liked them. I, PP, promise to be your one true companion and partner till eternity. I cherish the wonderful days that are ahead of us. I also realize that there may be days that we would want to forget. I promise to be completely by your side in joys and sorrows, in sickness and in health, through all these times of highs and lows. I promise that I will always respect you and I will always support and encourage you. I promise that I will always love you as you are. I look forward to our next adventures in life, and I look forward to growing old together with my best friend. I just got choked up again typing them out. I, CC, promise to be your equal partner in life; to be fair, honest faithful and kind. I promise to have patience, and to listen, to be hardworking but fun loving, and to always be ready for the next adventure. I will always strive for a happy, supportive and loving home and family. And although I can’t promise that I’ll eat daal-bhat everyday, I do promise to be the best companion, wife and friend that I can be. Even with my little line of humor in there, P won the best vows award for sure. Next I had to put my own intercultural spin on things. I can’t help myself. When P went back to Nepal in April I asked him to bring back a small vial of dirt from his backyard. Meanwhile I asked my dad to do the same. Instead of the “sand mixing” ceremonies some people are doing these days I decided to do a “Mixing of the Earth” ceremony. P and I exchanged rings, and then as per my mother’s request, we did a unity candle. P’s mom and mine came up to the gazebo with us and lit candles, and then the two of them lit the larger candle together to symbolize our two families coming together. "Husband and Wife" It has a nice ring to it, don't you think? We did the picture thing with the wedding party and the family during the cocktail hour, and then the bridal party was announced and P and I did our first dance… to John Lennon’s cover of Stand By Me. P and I probably should have practiced first, we probably looked a little stiff slow dancing together, but he did manage a few spins and it was very sweet. My sister K did her maid of honor speech which was also very touching. Both she and the best man, S, were so nervous to do their speeches (I was surprised about S, he loves to talk!). But they both did a nice job talking about their relationships with us individually and us as a couple (including a funny line from S about how when the two of them were the only Nepalis in rural Maine and went everywhere together people probably thought they were a gay couple ;)). I think generally during wedding dinners the DJ is supposed to play less danceable music so people can sit and eat. I even think some of our friends were planning to make short impromptu speeches during dinner, but then our DJ said, “The dance floor is officially open” shortly after the MOH and Best man speeches, and my mother’s family took it literally—there was pretty much non-stop dancing the rest of the night. Other than cutting dinner a bit short, I thought the DJ did a fantastic job. I had asked him to do a mix of classic rock/rock and roll dance hits with a few modern songs peppered in, as well as some Nepali/Bollywood songs that we gave him (originally on a CD, but I think P’s brother gave the DJ his laptop to hook up to the sound system with all his playlists). In the beginning the American hits had the Americans on the dance floor, and the first Nepali song that came on cleared the Americans but brought all the Nepalis up, which I think my American family found interesting, but as the night progressed I think the dance numbers became more integrated. I’ve mentioned this before—but there are certain songs for which I will literally drop what I am doing and run to the dance floor for. I know I am probably super lame, but I LOVE some of those group dances, specifically “Shout!” “YMCA” and the “Chicken Dance.” I’ve written about this before, but I’m always a little sad when people put the Chicken Dance on the do not play list, and I was certainly sad when the DJ told me that the “YMCA” wasn’t popular at weddings anymore. We did all three with full dance floors. I actually wanted one Nepali friend to lead the Chicken Dance (because of a dare from a few years ago), but I didn’t get a chance to arrange it with all the dancing and socializing with guests. Other great songs from the night—I asked the DJ to play “Kathmandu” by Bob Seger since a lot of the guests were from there, and that was really fun, especially yelling out “I think I’m going to Kathmandu! !” and “K-K-K-K-K-K-K-Kathmandu!” and of course dancing with P to “Pretty Woman,” “Sweet Caroline” (and shouting “So good, so good, so good!” would have been more fun had the song come later in the night). There were a few big Bollywood numbers of course, like “Desi Girl” (for which R yelled out, “You are officially a Desi Girl now! 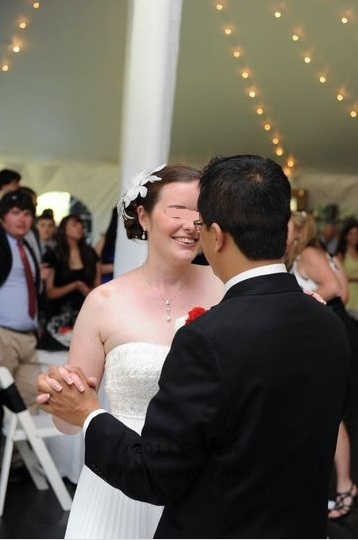 !” as we both spun around on the dance floor), and my uncle requested “White Wedding” and my family made sure I was on the dance floor for that. 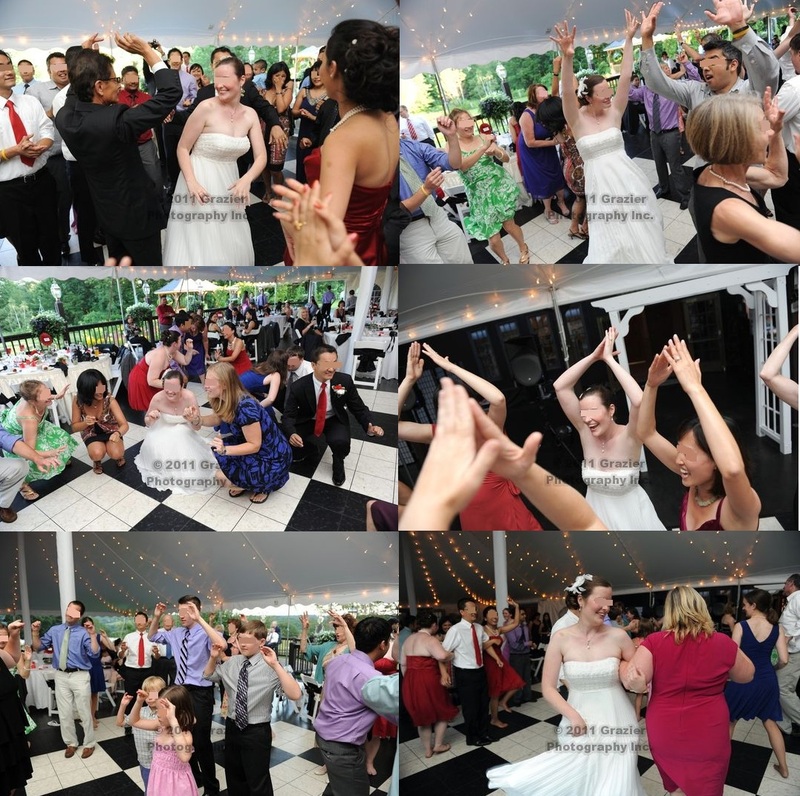 Weddings where people dance are a lot of fun. I’m not really one to go “out” to dance (clubbing, etc), but I love to dance at weddings (I think in part because I love the older music). It must run in the family, because my mother was tearing up the dance floor– even dancing with P’s dad–so much that at one point he must have tripped, because he wound up on the ground. It was a lot of fun. The night passed so quickly. I was really glad to have two wedding days to talk with people more and have more time to enjoy. I was literally running on pure adrenaline by the end of the night, having barely touched my food. It was so much fun, I didn’t want it to end. As we finished the night, the farm/wedding venue owners met P and I at the door with a basket of goodies for the morning—juice, milk, muffins, Danish, and two pieces of wedding cake in case we didn’t have a chance to eat during the reception. As the last guests headed out P and I walked across the parking lot to the bridal suite. 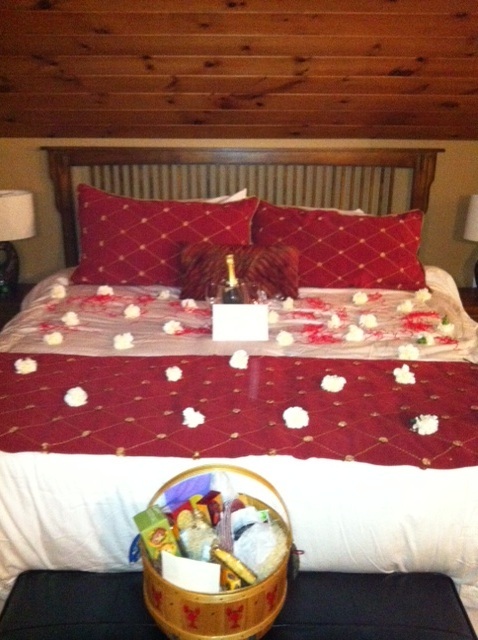 During the reception AS and R snuck over and decorated our bed with flowers and left us a bottle of chilled champagne. Another friend left us a “honeymoon basket” of snacks—cheese and crackers, chocolates, nuts, sweets, etc. Everything was so beautiful, and all these kind gestures reminded us of how important and special all our friends are to us. I took a break from writing about the wedding weekend, but I’m ready to close the series with the last few posts. Connect with the other posts starting HERE. The morning of the Red Wedding I opened my eyes and stared at the ceiling thinking, “Today’s the day I’m getting married.” But it didn’t feel like it. I was surprised at how un-nervous (if I can make up a word) I was for the day to proceed. Even getting dressed in the red sari, and arriving at the temple, and meeting the guests, and sitting up on the altar under the mandap, I didn’t really feel nervous, more anxious, maybe, that everything goes well, and that people enjoy themselves, and perhaps curious of how everything would happen, but I wasn’t really nervous about getting married. And it did. Maybe not right away… I didn’t really feel it when I woke up that second morning. But as the day progressed, I could feel it, a bit of nerves, a bit of excitement, a feeling of, wow it’s finally here. I was really appreciative that we did two ceremonies. I was so happy to experience the Nepali way of getting married, but I was also very happy to have my own way as well, something I didn’t expect until it actually happened. I got out of bed and snuck downstairs to eat something for breakfast. The hotel lobby was full of wedding guests. I spent a little while chatting with different groups of people, while trying to chew a few bites of a plan bagel (without much success.) I rounded up my mother and sisters so that we could get to the hair appointments (there was a misunderstanding and the hair people scheduled us really early for our afternoon wedding) and I loaded up the car with all the white wedding stuff. Again my “control freak” nature took over, and I couldn’t sit down and breathe until I knew everything was good to go, that everything that had to be at the wedding venue was there, and that all the pieces were in place. I finally achieved that status around lunch time and could sit for a little while. I took my turn in the hairdresser’s chair, and my sisters bought some raw veggies and dip to snack on while we got ready and waited for the wedding to begin. 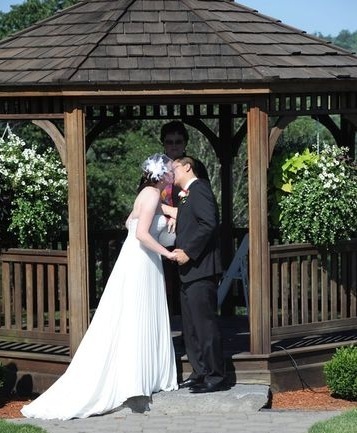 P and I had found a wedding venue about twenty minutes from where we live in MA where we could get married outside and have the reception in a tent behind the reception hall. The place was a family owned dairy farm, which had been converted into a reception venue when the farmer and his wife (a caterer) wanted to retire from the daily grind of farm life. The old dairy barn was beautifully reworked into a great hall space, and the family run catering kitchen continued to use many of their farm grown produce in the catering dishes. The barn was situated on top of a large hill with a view of rolling forested hills in all directions. It was a quiet, peaceful and picturesque spot. Across the parking lot from the barn/reception hall was the farmer’s old house, which was converted into a hair salon/spa and bridal suite. My mom, bridesmaids, and I got our hair done on premises, and hung out in the bridal suite before the ceremony, and P and I were planning to spend our first night at the suite that evening. Perhaps it was because during all the previous days I had been going, going, going, but when I finally had time to sit on my own and breathe, that’s when I started to feel a ball of nerves in the pit of my stomach. At first I actually thought that the veggies and dip had upset my stomach, but then I realized that it was excitement, and nerves, and energy. All this pent up emotion from planning, and thinking about it, and now we were only an hour or so away. R, AS, K and M helped each other with their final bridesmaid touches while my mom and I headed across the parking lot to the barn to sit in the “private waiting area” until the time to walk in began. Unfortunately many of my relatives were walking in at the same time and started to say, “Oh how pretty!” so I started frantically saying, “Please close your eyes, close your eyes! You’ll see everything soon.” I hurried to the waiting room only to find the door locked. “But I’m nearly naked!” the person inside said. “Normally it would be okay, but everyone was outside. I wanted to keep hidden,” I said. They quickly finished getting ready so they could take their seats. My mom and I sat in the room on our own waiting for the venue coordinator to come back and get us. So we took a few breaths and got ourselves together. Then the knock came from the venue coordinator. It was 4pm. Time to walk down the aisle. Friday morning I woke up to a torrential downpour. No—what’s the next level above torrential downpour? Because it was coming down in buckets. I had been afraid to check the weather most of the week, because I knew weather was out of my control, and if I didn’t like what I was going to see, I almost didn’t want to know. With all my bad luck in the previous few weeks I thought for sure it would rain for our weddings. About ten days before Weather.com said that there would be rain on Weds, Thurs, and Friday before our wedding weekend, but it would be partly cloudy and dry on Sat and Sun; however as the days dwindled down, the rain didn’t materialize, eventually the reports said rain on Friday and Saturday. I rationalized that the red wedding was mostly inside, so if it was going to rain one day I’d rather it on Saturday, but waking up to the gray dismal sky I couldn’t help but be a little worried for the whole weekend. When I got up I noticed P’s parents weren’t around. They had taken advantage of a brief lull in the rain to take their morning walk, so I went down with my sister K to walk our dogs, and to run to the local Dunkin Donuts to get my mom a coffee. Before I left P said that he thought his parents had already walked to the Dunkin Donuts, but I thought he was kidding. Lo and behold, as I drove up to the DDs I saw P’s parents carrying a box of donuts under an umbrella. I pulled over to the side of the road and offered to drive them back, but they waved me off. They must have felt that they were “hosting” my mom and sisters and wanted to bring back breakfast, which was sweet (although they brought back a bunch of plain donuts instead of chocolate, glaze and other more colorful flavors). I got the coffee, drove back, and by the time I grabbed my wallet to run to the henna place the sky had opened up again. In the few feet from our apartment door to the car I was nearly soaked through. So I went in search of my soon-to-be in-laws, imagining them drenched carrying a soggy cardboard box of donuts. I drove up and down the street three times, but I couldn’t find them anywhere. I even ran into the Vietnamese grocery store looking for them (becoming even more wet in the process) to no avail. I called P and told him how bad the rain was (“I can barely see through the windshield with the wipers on full blast!”), and that he might want to take a car out looking for them, because I was getting late for my appointment. I arrived at the beauty pallor about fifteen minutes late. I was already starting to regret making the appointment. 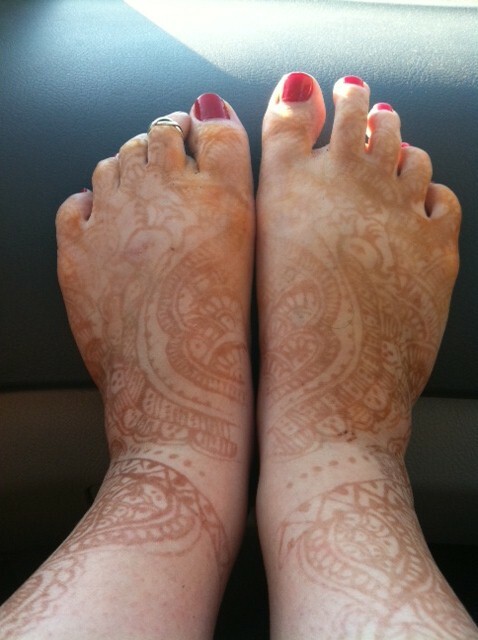 I thought it was probably frivolous to get my feet hennaed, and that maybe people would be upset with me, that it would take too long, that it would look ridiculous. The woman who was doing the henna reassured me it was fine, and we looked through the books of designs. I picked something that was a medium level of intricacy, not all the way up the leg, but a small design on the ankles, with peacocks on the inner tops of my feet and fans around the edges. By the time the shop officially opened and the two other employees arrived, one foot was complete. One of the workers was Nepali. She had just arrived from KTM six months before, and was excited to sit with me and talk. I had started the conversation with “Nepali ho?” as she walked by and she was eager to talk to a westerner getting married to a Nepali man. She had a lot of questions—had I been to Nepal? Had I seen a Nepali wedding before? Did I know about tilhari? About sindoor? I told her about the dubo ko mala P’s parents had brought from Kathmandu and that we were keeping in our refrigerator covered in wet towels to keep them fresh for the wedding. She told me that she was Gurung but her husband was Chetri (a love marriage), so their wedding customs were very different (“In my culture we don’t have red tikka, we have white tikka. We are not Hindu we are Buddhist.”) I explained to her that my soon-to-be MIL is also Buddhist (Newari) but married a Chetri so she follows many Hindu customs as well. As we spoke the Nepali woman grew more excited, and started calling me “Bhauju” (sister-in-law). She offered to thread my eyebrows to make me “beautiful for the wedding.” When she started asking for details about when and where the wedding was taking place, I half expected her to show up the following day, but she didn’t. The torrential downpour had started to subside, and even though my feet were not completely dry, I was running late to meet my bridesmaids (my sisters K and M and friends AS and R) who had planned a pre-wedding spa appointment as a mini bachelorette party. We were supposed to have lunch (which we missed due to my feet taking longer than expected—the Indian woman originally told me “it will take only half an hour,” but then I ran fifteen minutes late looking for my inlaws in the rain, and the feet took an hour and a half). We hoped that skipping lunch would help get us in and out of the spa quicker, but the spa still took a long time. At the spa I had my nails done, and a massage to help relax. The massage was nice because it forced me to sit quietly for a little while and collect my thoughts (I was mentally making checklists—go home and grab this, this, and that, etc). Everything seemed to be happening really quickly. As soon as I was done with the massage, I told the girls I had to run home and change and grab some stuff for the white wedding rehearsal, and that I would send R’s husband S to pick them up and bring them to the white wedding venue. I got home to find the rest of the family ready and on their way out the door. I jumped into my rehearsal dress, grabbed the bridesmaids gifts, my dad’s tie and dhaka topi, the seating chart for the dinner tables, extra programs, extra copies of the readings, etc., and shooed S out the door to pick up the girls. At the spa R and AS had complemented my feet. In retrospect I was glad that I took the time to do henna, even though it made the entire day run late. It’s now pretty faded, but when I look down at my feet it reminds me of the wedding, and makes me smile. 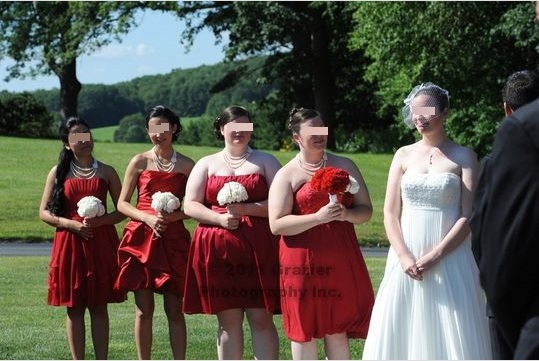 It was also like a nice little secret, throughout the wedding weekend I could lift my skirt a few inches to show off my feet like a surprise detail, but they were mostly covered so people only saw them if I wanted to show them off. I understand that I’m really pushing my family in many ways to think outside the box here. I know that being outside your comfort zone is a challenging place to be. Because of this, there are certain things I want to be mindful of so that they don’t feel like more importance is snatched away from their ceremony. And one place I realized this could happen recently is the exchanging of wedding rings. 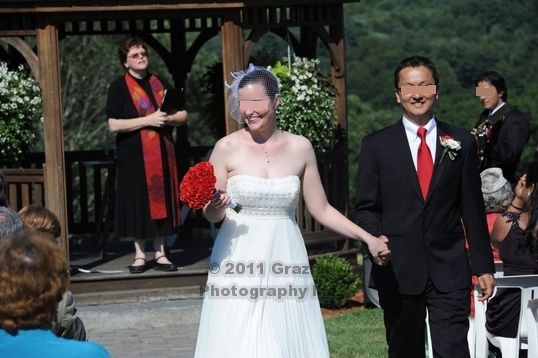 Two sets of our good (Nepali) friends have gotten married in the past few years. 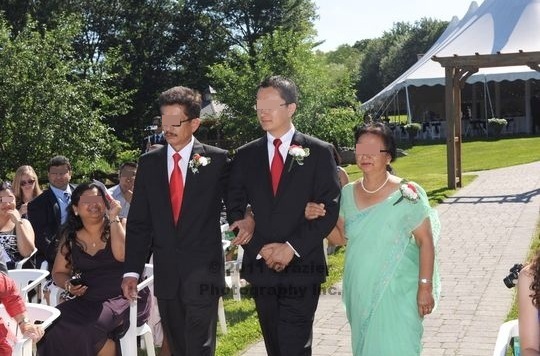 S and R (Swayambar) and AS and N (Nepali Wedding in New England). 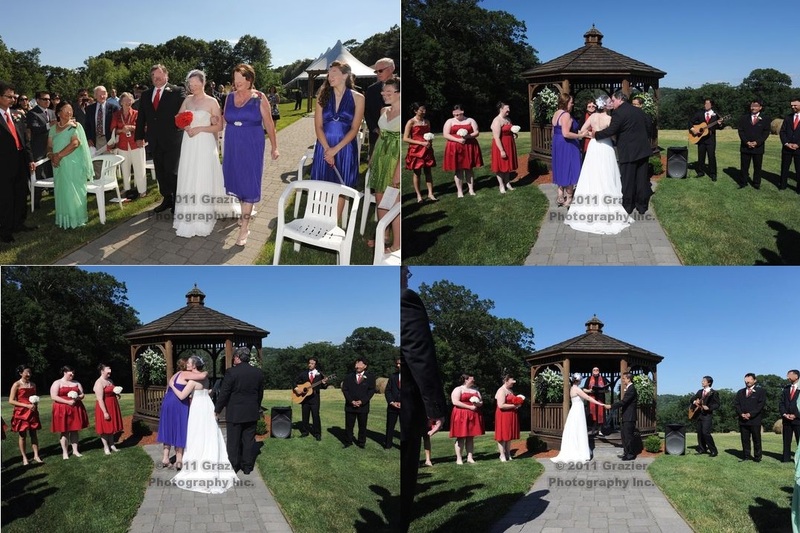 Through both of these weddings I was able to learn a lot about what happens and what is important for the ceremony/ies. Dressing the part—check, exchanging the garlands—check, bride receives pote—check, groom puts sindoor in bride’s hair/forehead—check. Both sets exchanged wedding rings as part of their ceremonies but it didn’t register with me that this was an important part of the process. To be honest, I actually thought they did this because they saw it happen in western weddings and liked the trend. Embarrassing cultural assumption, I know. But I was thrown off by S never wearing his wedding ring and R not really minding (I told P—once we get married, I hoped—well, expected—he would wear it every day, because I thought it was an important symbol of our life together). AS and N wear their rings all the time, but it still didn’t register. “I don’t think so.” He responded. I think P gets that this could be problematic, but I think he is also hesitant to change this piece of the Nepali ceremony. It will have to be a discussion had when he is at home. Meanwhile I was driving with S-di and I was asking her about this. We were brainstorming—what might be a viable option, that wouldn’t seem to be stepping on the American tradition’s toes? What about putting the rings on a different finger?—seems too much like our tradition. What about having totally separate rings (a second set?) – also too similar? What about exchanging rings but not putting them on, just holding them in our hands?—ditto? Or odd? What about doing something different—using string, or tying holy grass into a loop? – Americans wouldn’t know this isn’t the norm, that we are using a proxy, but the South Asians might find this bizarre. Skipping it all together and offending the Nepali cohort, or biting the bullet and offending the Americans? This is kind of funny—the other day I wanted to tell a story about exchanging wedding rings, BUT as I started, all these other contextual pieces began jumping in first to set the mood as to why my family has been a bit “sensitive” about how the American wedding is organized. I’ll get to the ring story eventually—but first another side tangent. Besides the lack of Catholicism in our American wedding, another sticking point in this process is that the Nepali wedding is happening chronologically first. We are doing both ceremonies in the US during one weekend in July. The Nepali ceremony was planned for Saturday while the American one was planned for Sunday. There was a very practical reason for this—in the US the most popular day/time of the week to get married is Saturday night. Thus wedding venues used to Western style weddings often charge (a lot) more if you book on a Saturday. Since South Asian wedding ceremonies can happen at any time of the week because they are generally based more on astrology than social calendars, there isn’t really the same type of extra price tag for a Saturday booking (assuming you are using a South Asian venue). 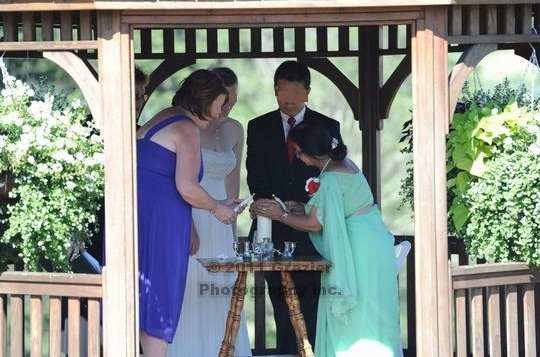 By organizing the Nepali ceremony on the more “expensive night” of the weekend, P and I were able to save a hefty chunk of change that we could put towards other details, like food for the Nepali reception. I don’t think my family necessarily sees the practicality in the timings, instead I think they see it as me privileging the Nepali culture over the American culture “yet again.” It will be “the first” wedding, all the marriage rituals will be “first,” I’ve even heard the criticism that people will be too tired during the American wedding because of the party for the Nepali wedding the night before… or even bored, because it will be the second wedding party. Some of these criticisms are probably petty, but it is a way to voice disappointment that I gave the honored “1st” spot to Nepal instead of America. “You let the Nepalis do whatever they want, and always give us grief. You respect them, but don’t respect us. Instead we are always bending.” is the mantra I hear. But I beg to differ. Since the Nepali wedding is happening in the US, there are already a lot of changes that have been made—1 day versus several ceremony/ritual days, fewer guests, less family, less formal, fewer traditions, in a place unfamiliar and less comfortable for P’s family. But my family doesn’t really see that—they assume that we are doing everything the way it would be done in Nepal, and no amount of explaining seems to get the message across that there is quite a bit of compromise on the other side as well. So to save myself from going crazy, and venting too much to family, I’m venting to the blog. I apologize for all the wedding related posts (please tell me if it gets annoying), and I appreciate the feedback and positive energy. I’m actually not tearing my hair out (although it might sound that way), but it is nice to have a sounding board. According to a wedding website I occasionally check for ideas, there are 230 days to go until my American wedding. Every time I click on links from the website’s e-newsletter a little banner at the bottom of the page reminds me how time is edging ever so closer to that final date. 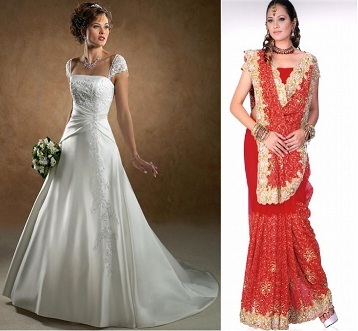 This pretty much sums up the duality of planning a “white” (American) wedding and a “red” (Nepali) wedding. The timings are completely different, and it is both frustrating, calming, and scary at the same time. I’m generalizing here—but most American weddings are planned several months, if not a year or more, in advance. 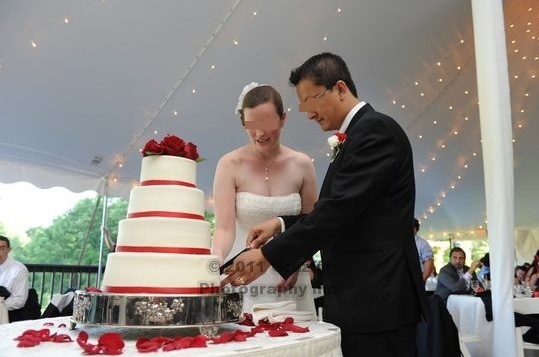 Nepali weddings, mmmm, not so much. You’re lucky if you have months, usually it is more like month or maybe even weeks. Which is actually quite astounding when you think about it. Most Nepali weddings are significantly larger (hundreds of guests) with more moving parts (multiple ceremonies and receptions) and more ‘plan ahead’ type issues like potential travel to the other side of the world and coordinating with relatives thousands of miles away! Meanwhile I’ll talk to my Nepali friends and the mentality is—the wedding is so far away. 7+ months… you’ve got ages! Why are you freaking out? Why do you need a wedding dress now? Who thinks about a photographer this early? Of course I have supportive friends as well, but I’m also a little worried that if I talk about wedding stuff with them too much I’ll burn them out since there is so much time left, and I don’t want to look crazy. And I’m stressing out about a wedding dress? At least I have a groom! So wedding planning has definitely been—er—interesting, to say the least. I think I’m getting hung up on little details like picking a white wedding dress because I feel like it is one thing I can control, amongst all these moving and uncertain pieces. I feel I have very little control over what the Nepali ceremony will look like, and I’m a little sad that P’s family doesn’t seem very excited to discuss details. Actually I have yet to mention the word “wedding” to them. A few people have talked about it on our behalf, but that’s it. I have to admit though, I’m kind of excited to go to Thanksgiving and Christmas festivities with my family. I’m excited to have a pocket of American-ness for a few days where people will ask me questions and be enthusiastic and not think it is too weird to discuss details that are 7+ months away. I’m nervous about more wedding culture conversation challenges, but I’m more excited about sharing my excitement. We will see how it goes. Wednesday my sisters are coming to help me choose a wedding dress. R has already gone shopping with me and gave some great feedback, so I’m looking forward to seeing what my sisters have to say. So that’s where I am right now. How about you?